Deans, EC3 or XT60 ??? 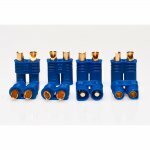 I am new to the hobby and am getting a few planes in the air and would like to get some input on what experienced flyers are using for electrical connections. I have a small biplane that uses JST connectors as it only draws about 5-7amps running on a 3s 450MaH battery pack. The question is my next size up plane. I ordered and built the FT Flyer and it comes with a 20 ESC with a XT60 connector on it. On the larger plane/Easy Star I already fly I run a 2200 motor with a 3s2200 MaH battery and a 40 amp ESC. On that plane I run Deans/Deans Style connectors on it. 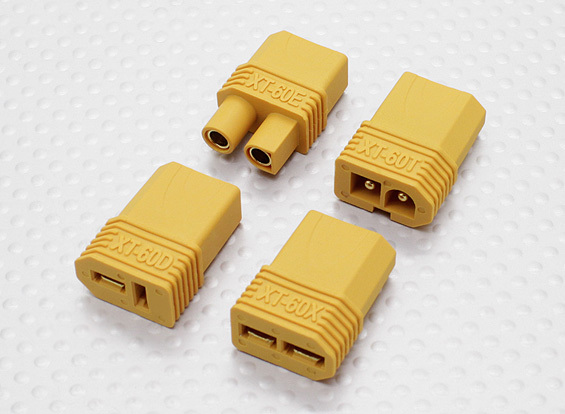 While I like the ** real** Deans connectors, I'm finding the Deans "Style" of connectors are a bit different and some are pretty hard to plug in/out. Some fit in pretty easy and others you have to work at it a bit. Some of the flyers in the RC club I'm in like Deans and others are using the other 2 types (EC3-XT60) I mentioned and really like them. I personally would go XT-60. All the batteries with XT-60 tend to be cheaper, and EC3 batteries will fit in an XT-60 plug. XT60. That is my short answer. I came to liking XT60's via liking the EC3's which as an electronics guy has easy to solder pins/sockets and I like how they mate up. I really don't know why Dean's has any appeal. I think they have a newer style that is improved but the older ones looked bad for the same reasons as the EC3 except Deans do it badly. So then why did I switch from EC3 to XT60? Glad you asked. Because when I buy batteries I would rather not have to replace every connector when it arrives but rather buy a decently priced battery with a connector that I already like. Since XT60's were similar and Hobby King was at the time (and still continue) selling most of their LiPo's with XT60's already on, the choice was easy. By the way, there is some cross mating possible with XT60 and EC3. You can fit the male of one into the female of the other but not the other way around. 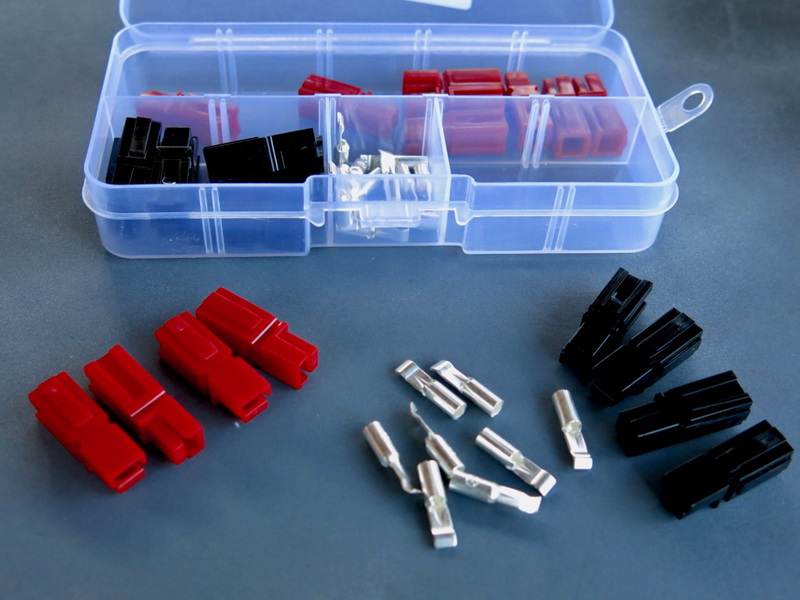 To help play nicer in the sandbox there are adapters to go from one kind (even Deans) to XT60. I use XT30 or XT60 on everything but a couple planes that are still using Deans, but I'll be changing those as soon as the batteries die their final death... Probably soon I find the XT's to be a lot less expensive, and easier to work with - both soldering and connecting/disconnecting. 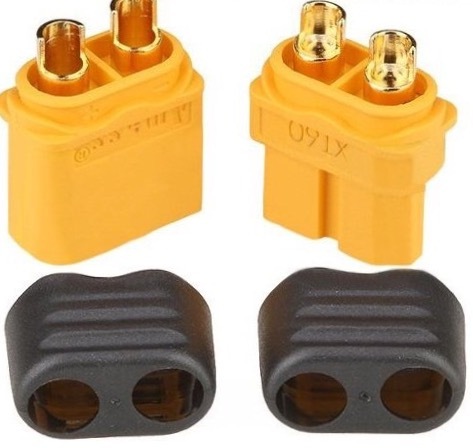 Should also note that those JST-RCY connectors are only rated for 3A, I don't like them for anything but VTx's. I'm a huge fan of these XT-60s with the slip on wire cover. No need for heatshrink and gives you much more to grab onto. I used deans for about a month until I got my first hobbyking order and my world was forever improved by xt60. I have a pouch full of deans connecters that I don't think no will ever touch again. I also use xt90 on my bigger birds with 70/80 amp ESCs. I've never had a failure and all of my batteries tend to arrive with the connecters that I want. Here in the UK there seems to be bit of nostalgia towards deans on locally made lipo batteries. I can't for the life of me figure out why. 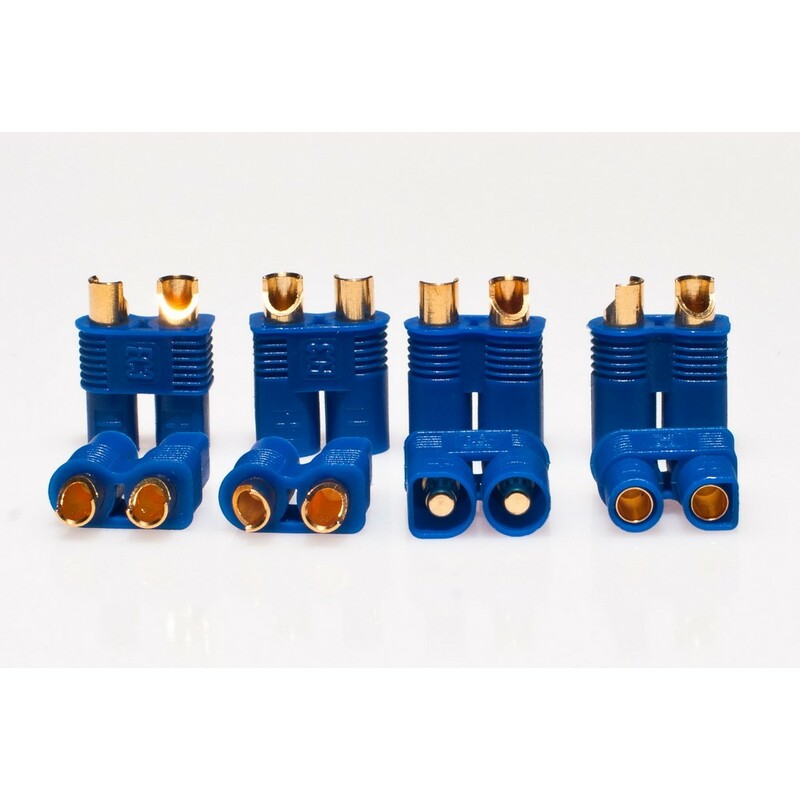 Setting aside the technical reasons, another advantage to getting into the XT family of connectors is unlike the other designs, this one is an open standard and doesn't require a licensing fee for a manufacturer to use it (unlike Deans, Castle, etc) - so the XT series is most likely to grow their market footprint. I used Deans when I raced Indy car rc and XT for flying. I like XT much better. XT series seems to be leading the standard as noted earlier. EC3 can be a royal pain to work with specially in smaller things in tighter spaces. The Deans came about because of the higher current capacity when used and are more popular in the car aspect of RC. One thing about EC3 that I like better is I can solder them outside of the blue backshell and then they snap in afterward. XT30s on my little airplanes and XT60's on larger. Seems like these are rapidly becoming the standard? I like em. Never cared for Dean's. 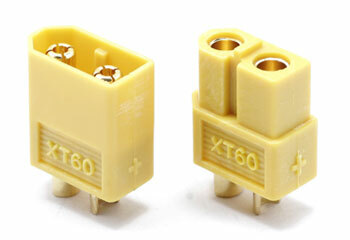 Thanks everyone for your replies to my question...Looks like I'll be going with the XT30 and XT60 plugs. Seems most people use xt60. I had a ton of deans lying round that I could use when I was in the hobby in the 90s. Deans were new then and xt60s did not exist. So right now I'm using them but I may swap at some point mainly because of its becoming a new standard. My 700 size helis all use deans. My traxxas XMAXX uses deans.... the wires get warm, connectors are cool. And after more than 15 years of using them and many hundreds of flights I have never had a problem. I've come across quite a few second hand planes in the recent few years from estate sales, swap meets, etc. (would you believe it, the latest was in goodwill), and a fair portion of them sported Anderson powerpoles most with connections that look over a decade old . . . from the corrosion. 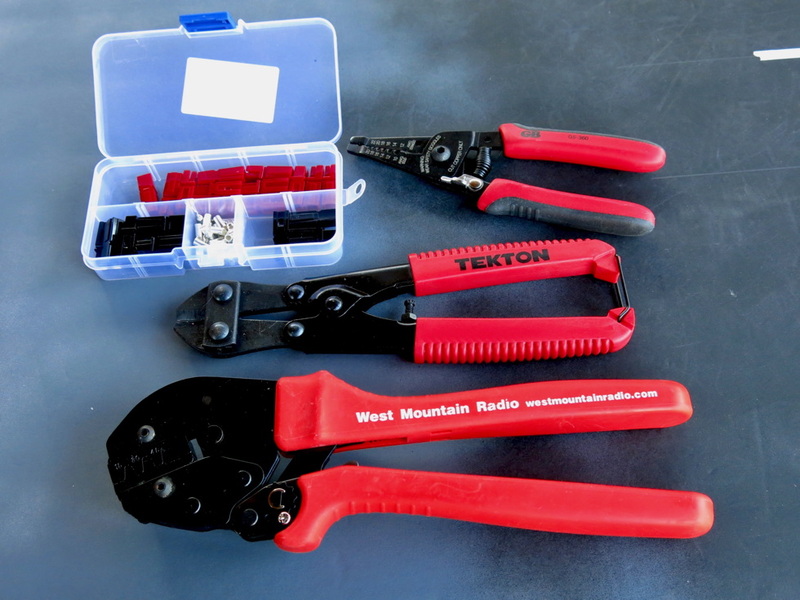 Most are marginal connectors and happily take a replacement without needing the electronics themselves replaced -- clean-up the wires and touch-up the hangar rash and the plane is as good as . . . well, good enough. I can't speak to all the reasons these planes fell out of favor of their owners (the estate sales aside, naturally) but I wonder if these connectors had been greased when new or replaced, whether they would have been sold. 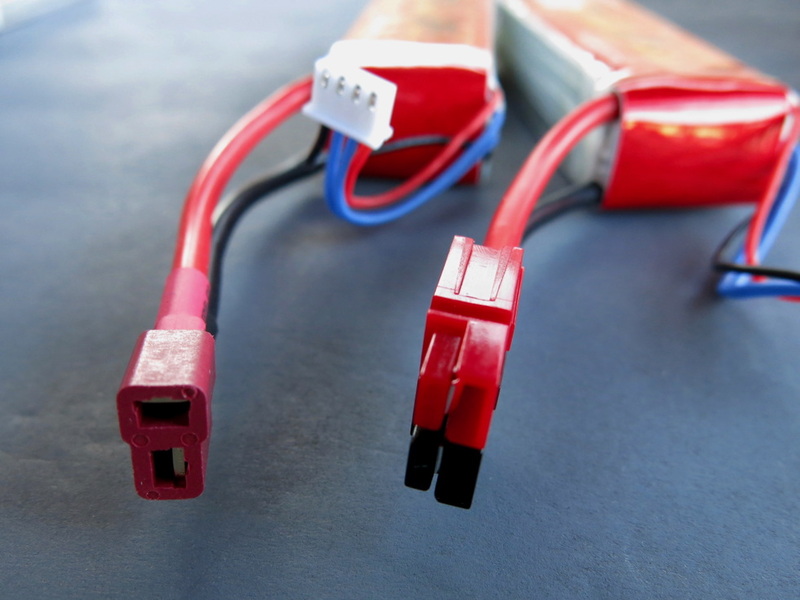 I don't hate crimp connections in the least and so long as you like them, Anderson power poles are a bit bulky, but fine in nearly all cases . . . but a little bit of dielectric grease goes a long way toward making crimp connections last. My choice is also XT60, no license fee. I recommend whatever your choice that you stick with it. With some of each you’ll always have to look for the correct converter. Life will be much better if all your stuff takes the same plug. Life will be much better if all your stuff takes the same plug.